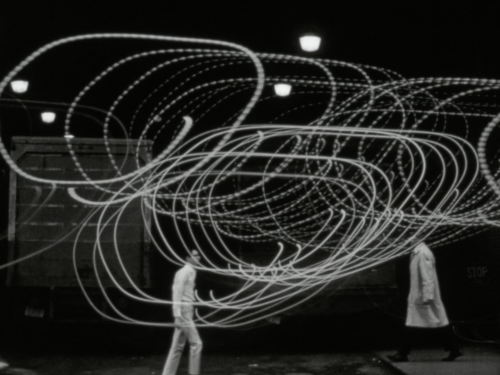 Designed to be Seen: Art and Function in Chicago Mid-Century Film presents—for the very first time—a series of screenings that reframe the history of cinema in Chicago through various lenses and modes of production. This four program series illuminates the diverse factors that have shaped the filmic landscape of the region from the mid-century through the 1970s. Form and Function: The Legacy of the Institute of Design, provides historical context and a new perspective on the lasting impact of Lászlo Moholy-Nagy’s teachings at the New Bauhaus. Two programs, The New World: Industrial, Corporate and Sponsored Film and Creative Broadcast: Communication, Commercials and Advertising, focused on industrial, commercial, sponsored, and advertising films, examine the innovative design work being done on film in the mid-century. Personal Legacies: Materiality and Abstraction, presents personal and experimental films made by the artists who worked for the design studios and corporations highlighted in the second and third programs of the series. As a whole, the series tells a chapter of Chicago’s history on film that has yet to be seen. This series uncovers the interconnected histories of commercial and artistic film production in Chicago and, in doing so, sheds new light on the multitude of ways in which art and design industries overlapped and intersected in the city. Designed to be Seen explores the distinct genres and production models that were most dominant during this period of time and provides a new perspective on filmmaking in Chicago. It illustrates the innovative ways in which artists and designers used the moving image to both tell and sell the stories of their time. The four screenings in the program are timed to complement other concurrent exhibitions taking place as part of the Terra Foundation’s Art Design Chicago Initiative, including those at our host venues: The Chicago Cultural Center and the Chicago History Museum. Designed to be Seen is part of Art Design Chicago, an initiative of the Terra Foundation for American Art exploring Chicago’s art and design legacy, with presenting partner The Richard H. Driehaus Foundation. Designed to be Seen is funded by the Terra Foundation for American Art and The Richard H. Driehaus Foundation. Personal Legacies: Materiality and Abstraction focuses on more personal and experimental films made by the individuals who were simultaneously working for the studios, agencies and design firms mentioned above. Intersections of the personal and the professional are explored through films including Robert Stiegler’s Capitulation (1965); Larry Janiak’s Adams Film (1963); and Byron Grush’s Fotogrammar (1969).